It’s very difficult to know how many words you have on your website. When you are focused on publishing great content and your website is growing, it’s easy to lose count of all your different pages and how many words you have on them. When the moment comes to translate your site with Weglot, it can be hard to know what’s your total number of words and which plan best suits your needs. If you ever tried to find an online tool to get your website word count, you know it can be hard to find a simple and reliable one. Most solutions count words on one page only and not on the whole website. And generally, it only includes words of an article and not all the words of the page (menu, header, footer, meta, etc). So we decided to build our own website word counter tool! How many words are on my website? Many of you were asking us for a simple way to scan your website and count how many words you have on it. Today, we are happy to release our brand new Website Word Count Tool! The Weglot Website Word Count Tool analyzes all your website pages and counts how many words you have on them. All the words that are in your HTML source code are taken into account, even SEO tags. 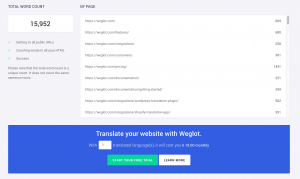 You can now easily know how many words you have on your website and see which Weglot plan best suits your translation needs. Simply go to Website Word Count page, enter your website URL and press enter. Once the scan starts, you can already see the tool in action. On the right side, you can see each separate URL with its total number of words. On the left side, the Total Word Count for your website starts incrementing. Please note that the total word count is a unique count. It does not count the same sentence twice. Important side note: the Website Word Count doesn’t analyze “private” pages. For example, pages that require visitors to be logged in will not be included in the analysis.